The opulent dress is the centrepiece of Vancouver Art Gallery's newest exhibit, which features 40 avant-garde designs from Guo Pei, China's foremost couturière. The annual Met Gala tends to stretch the limits of fashion's imagination, with ornate couture designs worn by the world's biggest celebrities. 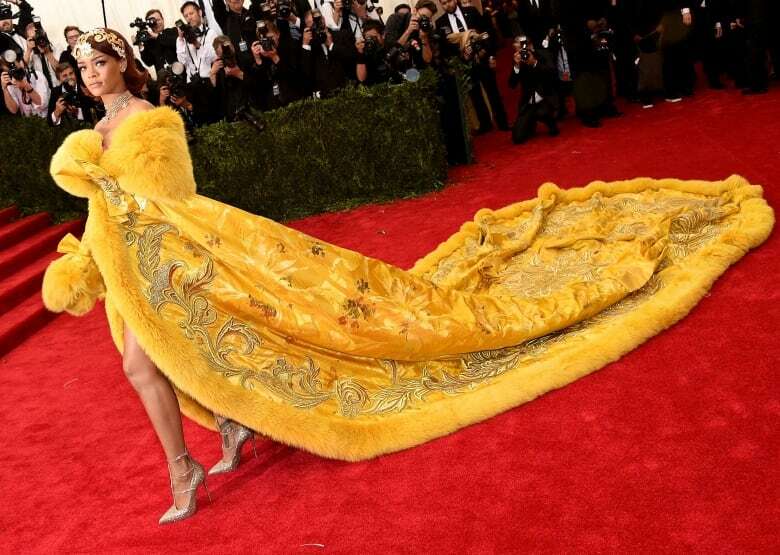 In 2015, one standout moment at the event featured pop singer Rihanna appearing in an imperial yellow, fur-lined cape that stretched into a massive five-metre train. It was constructed with 55 pounds of embroidered silk and took two years to complete. The opulent creation — titled One Thousand and Two Nights — is the centrepiece of the Vancouver Art Gallery's newest exhibit, which features 40 avant-garde designs from Guo Pei, China's top couturière. She is the only Chinese national designer ever invited to present her creations at Paris Couture Week. The Rihanna outfit changed Guo's career, but she had been painstakingly crafting her designs years before that. The exhibit, which opens Oct. 13, traces the evolution over 10 years, with notable examples from her early collections. It's also the gallery's first ever fashion exhibition. Guo's dresses demand the kind of scrutiny you'd expect from a Caravaggio painting. They're chock full of symbolism, fusing contemporary design with ancient Chinese motifs. "Guo's pursuit of excellence is unmistakable in every stitch of her creations," Kathleen Bartels, the gallery's director, said in a statement. "Each of her designs is a masterpiece and a feat of craftsmanship." Guo launched her label and atelier, Rose Studio, in 1997. It now employs more than 500 workers, including skilled artisans and technicians, who produce up to 400 custom garments each year. The designer is also the subject of the documentary Yellow is Forbidden, which played at this year's Vancouver International Film Festival. The exhibit runs from Oct. 13 till Jan. 20, 2019.